It’s amazing how just a few ingredients can create something amazing. This one pairs (pardon the pun) pears with ginger. They’re a match made in heaven. Pears and ginger are a common combination. There are excellent recipes for pears poached with ginger, pear crumbles, smoothies… The spiciness of the ginger is a fantastic foil for the sweetness of pear. Here’s a “did you know?”: You can ferment pear juice into pear cider, called “perry.” I may have to look into that one. Once the pears really start rolling I also hope to preserve some with ginger for later. There’s nothing like memories of harvest in the dead of winter. There are many different types of pears, each with their own strengths and weaknesses in preparation. 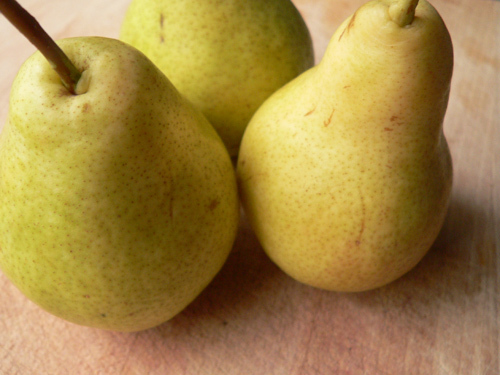 Some common names, are Bosc, Bartlett, Red, Anjou, Seckel and of course Asian pears. They can be red, yellow, green and brown. All are the same sort of beast except for the Asian, which is round like an apple with a consistency more like an apple than a pear. They’re great in salad, crisp and juicy. fond) help flavour the sauce. Several of our local pears (Bartlett, Bosc and others) are starting to appear in the groceries as the fall season starts to pick up. The trick to pears in this recipe is to find ones that are ripe but still a little firm. I used Bartlett. Over-ripe (soft) pears will cook away to nothing. For this we want identifiable slices. Use the soft pears for smoothies or a juicy, delicious snack all on their own. Pears are a nutrient dense food, meaning they provide more nutrients per calorie than calories per nutrient. Pears are a good source of dietary fibre and potassium as well as Vitamin C. Interestingly, most of those are contained in the skin, so when you peel pears you’re losing a lot of the heathy goodness. If you wish, you could leave the skins on, but the presentation wouldn’t be as nice. It’s up to you, of course. This recipe is not a highly “spiced” dish. The flavour is carried in the pears and ginger. So make sure that your pears smell ripe when you purchase them. They need to have a strong pear smell. I hope you try this recipe. It’s a great way to serve boneless, skinless chicken breasts in an elegant way. I can’t really say super healthy because the sauce is composed of reduced whipping cream. But what’s a little cream every once in a while? Yum…. Melt 1 tbsp of butter in a large sauté pan that has a cover. 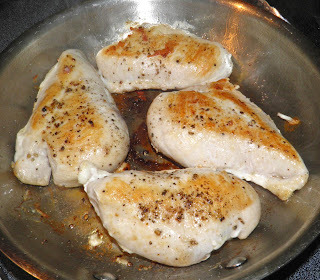 Season the chicken breasts with salt and pepper. Sear both sides in the hot pan until browned, but not fully cooked. Remove to a plate. Add the second tbsp of butter to the pan. Quarter and then slice the onion into thin pieces. Peel and finely chop the ginger. Sauté the onion and ginger in the pan until the onions have softened slightly. Peel and slice the pears into about six pieces from each half. They need to be big enough not to break apart too much when cooked. Add the wine to the onions and scrape the fond off the bottom of the pan. 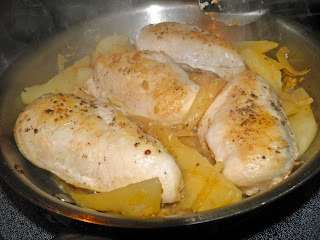 Add the pears to the pan and then place the chicken breasts on top of the pears. Cover the pot with the cover slightly ajar. Let cook until the wine has nearly evaporated. This will take about 6-8 minutes. 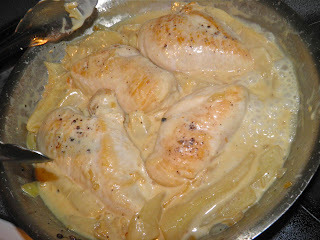 Pour the whipping cream into the pan and cook, uncovered, until the cream has thickened into a sauce. 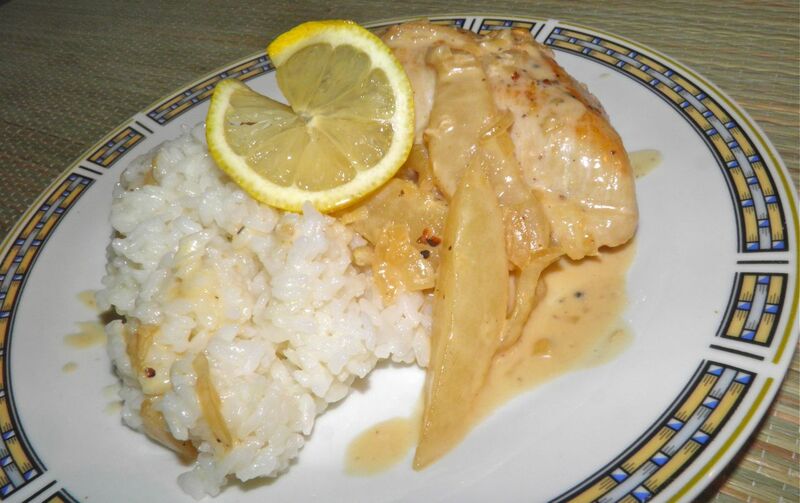 Serve the chicken with the sauce on top and buttered rice on the side.